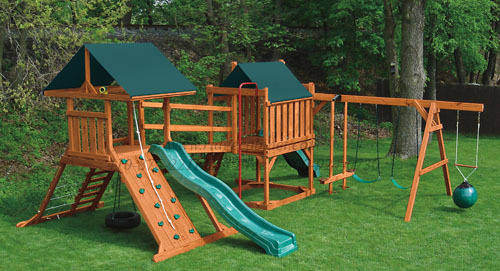 Children's Contemporary Wood Play Set with Climbing Tower, Fireman's Pole, Playhouse, 2 Scoop Slides, Cargo Net, Tire Swing, Mountain Climb, Swing Set, Buoy Ball, Glider, and much more . . . The ground area recommended for this set is 27ft long and 26ft deep.